Retinoblastoma mnemonic this month. Plus information on lower sugar content recipes for the reintroduction of cows milk into a child’s diet, labial adhesions, 6 in 1 vaccine and don’t miss infantile spasms as early treatment improves overall prognosis. Do leave comments below. The Acquarone Detection Scales for Early Relationships are observational scales that provide a powerful tool for assessing an infant’s capacity to form relationships and a mother’s ability to respond to her infant. The scales have been developed during several decades of clinical practice by Dr Stella Acquarone, who is also the author of several books on infant development and parent infant psychotherapy and Principal of the Parent Infant Clinic. The Parent Infant Clinic is a private service but does have some subsidised places for families with limited financial resources. There are two scales, a 25 item scale for observations of the infant and a 13 item scale for observations of the mother. In each case observations are divided into four domains: interpersonal, sensorial, motor and affect. Within each domain observers are asked to note the frequency of certain behaviours. For example, when observing ‘calling’ the observer is looking for ‘facial expressions, noises or gestures that seek to produce an affectionate response from the partner’. A concern about the infant or the mother might be raised if a particular behaviour was never observed, perhaps showing a difficulty in relating, or was constantly observed, perhaps showing a defensive repetitiveness. The scales can be used to establish a thorough observational benchmark against which later changes can be compared. November 2015: diagnosing asthma this month, a synopsis of vitamin D deficiency as we go into the winter, a helpful cartoon around mental well-being and hypermobility demystified. All comments gratefully received! – with thanks to Dr Joe Ward, paediatric registrar at Whipps Cross University Hospital. Hypermobility = synovial joints moving beyond normal range of movement. 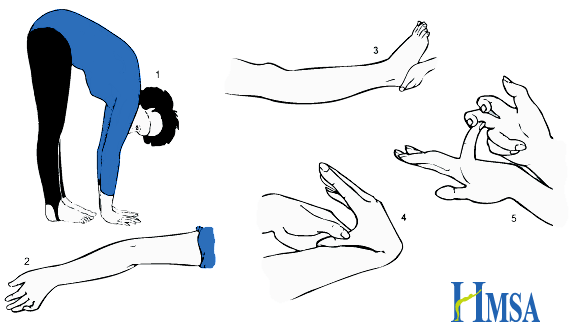 Scores of 4 or above indicate Generalised Joint Hypermobility. May be asymptomatic, or associated with joint pain (exacerbated by exercise), dislocations and fatigue. Chronic pain often leads to muscle weakness. Other associations include dizziness and syncope and gastrointestinal problems such as chronic abdominal pain and constipation. Physiotherapy and exercises to strengthen muscles around hypermobile joints provide the mainstay of treatment. Exercises to improve balance and coordination may also be helpful as proprioception may be impaired. Occupational therapy input may be beneficial. The Brighton Criteria (NB: Brighton, not Beighton) is used in adults to diagnose Joint Hypermobility Syndrome. To make the diagnosis you need one of: two major criteria; one major and two minor criteria; four minor criteria; two minor criteria and one affected first degree relative. The presence of an underlying syndrome excludes the diagnosis. It is not yet validated in children. Ehlers-Danlos Syndrome (http://www.ehlers-danlos.org/) – Heterogeneous group of disorders involving skin laxity, joint hypermobility, and vascular complications. Defined by the Villefranche Classification. Marfan’s Syndrome (http://www.marfan.org/about/marfan) – Autosomal dominant connective tissue disorder. Typical features include characteristic facies, joint laxity, musculoskeletal problems (bone overgrowth and disproportionately long limbs), lens dislocation, and cardiovascular complications including aortic root dilatation. 1. Cattalini, M., Khubchandani, R. & Cimaz, R. When flexibility is not necessarily a virtue: a review of hypermobility syndromes and chronic or recurrent musculoskeletal pain in children. Pediatr. Rheumatol. Online J. 13, (2015). 2. Pacey, V., Tofts, L., Wesley, A., Collins, F. & Singh-Grewal, D. Joint hypermobility syndrome: a review for clinicians. J. Paediatr. Child Health 51, 373–380 (2015). Chest pain this month – which is very rarely cardiac in the paediatric population, early recognition of various childhood cancers, links to some drug and alcohol support groups, paediatric drooling. Do leave comments. Have just uploaded February 2015 newsletter – with 4.5 hours of February to go….